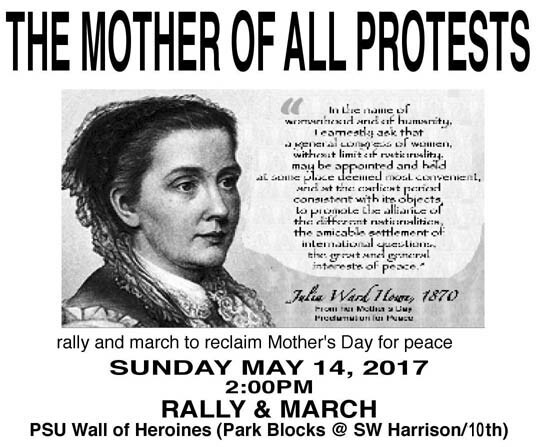 EVENT: "The Mother of All Protests"
Walk of Heroines, Portland State University, SW Harrison and 10th. Peace and Justice Works will host a rally and march on Sunday, May 14, Mother's Day, titled "The Mother of All Protests." We will gather at 2 PM at the Walk of Heroines at Portland State University, SW Harrison St & 10th Av (note: Streets do not go through to the Walk, which is on block north of the Park Blocks). PJW rejects the terminology and use of the "Mother of All Bombs" in Afghanistan, dropping bombs on Syria, killing civilians in Iraq, rattling the sabre in North Korea, and other warmongering by the US government. The militarism is connected to other domestic and foreign policy issues that are quickly taking us further into the World War the US started after 9/11. This is a peaceful march and rally, to foreground women and women's roles in creating Mother's day over 100 years ago as a day for world peace. Julia Ward Howe wrote in 1870 about an international women's congress which would "promote the alliance of the different nationalities, the amicable settlement of international questions, the great and general interests of Peace." Part of the reclamation is to stop using the term "the Mother of" to mean "the largest of" or "the event to end all other events." It means the origin of, or one who gives birth to-- as the origin of Mother's day gave birth to this demonstration. On May 6, Pope Francis condemned the US' naming of its bomb, saying: "I was ashamed when I heard the name. A mother gives life and this one gives death, and we call this device a mother. What is happening?" (Reuters, May 6). Coordinated by Peace and Justice Works Iraq Affinity Group. Cosponsors include Women's International League for Peace and Freedom-Portland, Veterans for Peace Chap. 72, Recruiter Watch PDX, Portland Fellowship of Reconciliation, War Resisters League-Portland and the Portland State University Women, Gender, and Sexuality Studies Department. Endorsers include Women's March on Portland and Little Light of Mine Friends Worship Group. For more information contact Peace and Justice Works at 503-236-3065 or pjw @ pjw.info. The action received positive coverage on two local stations.